At the Illinois Top Times meet, I was assigned to cover the field events. Reporting more field events was the chief goal of our team because we wanted diversity in our coverage. This worried me because I had no experience with doing field events myself. I was also afraid that I would be overwhelmed by the amount of events going on at the same time. It was unknown territory for me. Although field events are often overlooked and may seem complicated, it becomes easy to figure out what's going on and to submerge yourself into the rest of the crowd. Figuring out what's going on during field events isn't as hard as it seems. For example, during high jump, an Illinois Top Time staff member was nice enough to explain to my fellow interns and me who was going and what he/she was planning to jump. Afterward, I talked to recruiting college coaches who told me about the athletes in the long jump and high jump. Becoming submerged into the rest of the crowd was the easiest part of my day. During the 2A boys' meet, somebody yelled: "that's my brother!" It drew attention to the high jump. Because of one person cheering, people started to shift their focus to David Emuze (Jr., Springfield South), who jumped 6'5" and placing second. Later on into the day, Kyshun Robinson (Jr., Proviso West) started clapping at a tempo which you could hear throughout the fieldhouse. Next thing you know, people from the infield and outside of it all had their eyes on Robinson and started clapping along. The clapping got progressively faster and then he went off. Robinson proceeded to achieve a 21'2" in the long jump. "It draws the crowd in," Robinson said when later asked about the clapping in an interview. On the contrary, the fans showed respect for pole vaulters like Chandlar Ifft (Sr., Prarie Central) by being silent and signaling others around to do the same. By doing this, it lets the pole vaulter focus on the great height ahead of him/her. The fans started clapping and cheering once Ifft was midair. Ifft cleared 15'6" and won the 2A pole vault title. The same thing happened with 3A thrower Sam Liokumovich (Sr., Deerfield) who had the crowd silent and focused, but then going crazy for him after he threw 64'4.75" on his third attempt in the shot put. 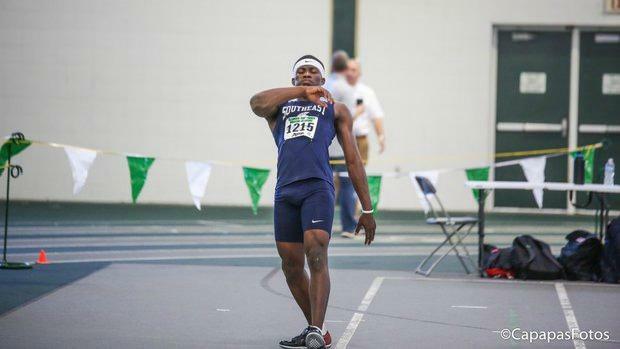 The energy of the crowd during the field events was definitely a contributing factor to a lot of the athletes' successes at the Illinois Top Times 2019 meet. Hearing a few people cheer sounded like a hundred in such a concentrated spot. The overall atmosphere was lively and friendly, but it wouldn't have felt that way without the crowd.